This is yet another good piece of feelings in the form of a poem by Shri Vikas Mehta ji. 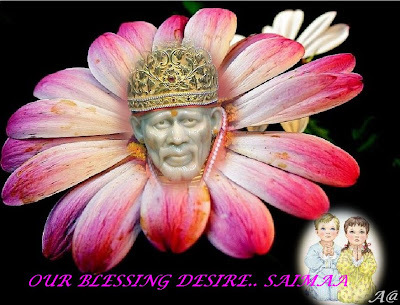 Poem depicts feelings of Shri Kakasaheb Dixit towards Sai Baba. A lot of articles are written about Kakasaheb Dixit on this blog and you can browse for any of them by the links provided below. I used to think and You used to do. My coffers were filled by Your powers. I was under wrong impression that Lord Vitthal appeared, but it was Your sport. I met a person who loved You dearly and who wrote Your name by roaming house to house. He told me that if Our relation is there, Baba will come to me. If you have love, flowers will blossom. I became Yours as soon as i saw You. When i saw You, i thought i have support of Your Holy Feet only. I got the One whom i was missing from past many births. When We talked i felt that a person aspiring for God, met God. I used to think and You used to do. My coffers were filled by Your powers. I cried, screamed and feared, but You made me sit beside You and explained me meaning of Bhagwat and Bhavarth Ramayan. Though it did not satisfy You and to came before me after Your Mahasamadhi. You made me realize that You are formless and with form. I understood this by Your sports. Then again You were anxious and called me to Shirdi in 1922. You made me meet S. B. Dhumal. You made Shirdi an organization with Your powers. Today also, i come here secretly and always find You in Your Dwarkamai. You are the same. People changed, bodies changed, but You have not changed, nor Your sports. Today i am proud of my lameness due to which i met You and removed lameness of my mind, made me sit in an aeroplane and merged me in Yourself forever.